The commemorative stamps of Italy, for the period from March 1936 to June 1937, celebrate an international trade fair, a famous Ancient Roman poet, and Italian children. The four stamps shown above (Sc. #355-58) were issued on March 23, 1936 to celebrate the 17th Milan Trade Fair. The four stamp designs feature symbolic representations of various Italian industries. The thirteen stamps of Italy shown above (Sc. #359-66, #C84-88) were issued on July 1, 1936 to commemorate the 2,000th Anniversary of the Birth of Horace. 10 C. - Flock of sheep. Fertilis frugum pecorisque tellus = Fertile fruits and cattle (yield Ceres crown). 20 C. - Countryside in Spring. Diffugere nives redeunt iam gramina campus arboribusque comae = The snow has scattered. Back comes the grass to the fields and the leaves to the trees. 30 C. - Ajax defying the lightening. Impavidum ferient ruinae = ... it would make him fearless. 50 C. - Bust of Horace. Non omnis moriar = Not all die. 75 C. - Capitol. Stet capitolium fulgens = The capitol stands gleaming. 1.25 L. + 1 L. - Countryside in Spring. Diffugere nives redeunt iam gramina campus arboribusque comae = The snow has scattered. Back comes the grass to the fields and the leaves to the trees. 2.55 L. + 1 L. - Dying warrior. Dulce et decorum est pro patria mori = It is good (or noble) to die for one's country. 25 C. - Seaplane in flight. Expertus vacuum daedalus aera pinnis non homini datis = Daedalus made trial of the air, with wings not given to man. 50 C. - Monoplane over valley. Hic in reducta valle = Here in a secluded valley. 60 C. - Oak and eagle. Duris ut ilex = Indignant at being overcome. 1 L. + 1 L. - Monoplane over valley. Hic in reducta valle = Here in a secluded valley. 5 L. + 2 L. - Ruins of Ancient Rome. Alme sol possis nihil urbe roma visere maius = Nourishing sun, may you visit the city of Rome which is nothing but the best. Quintus Horatius Flaccus -- called Horace (65 B.C. - 8 B.C. 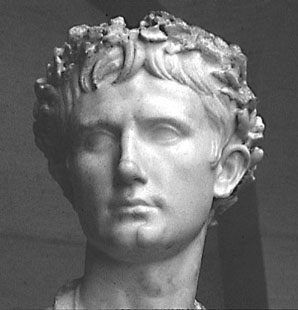 ), educated in both Rome and Athens, was the leading Roman lyric poet, satirist, and critic during the Augustan Era. His career coincided with Rome's momentous change from Republic to Empire. Being an officer in Brutus' republican army defeated at the Battle of Philippi in 42 B.C., he was pardoned following the battle. He later befriended Maecenas, an adviser to Augustus, which brought him into the emperor's inner circle. After the civil wars, he became a clerk in the Treasury in Rome, and it was at this time that he began to write. His most famous works are his satires (35 B.C. - 30 B.C. ), his epodes (30 B.C. ), his epistles (21 B.C. - 11 B.C. ), and his odes (23 B.C. - 11 B.C.). Most of the Latin verses on the stamps described above are from his odes. He was highly praised by contemporaries of his time, and over 2,000 years later, his works have provided inspiration for many modern poets. The sixteen stamps of Italy shown above (Sc. #367-76, #C89-94) were issued June 28, 1937 to publicize the Summer Exhibition for Child Welfare. The stamp designs feature various views of Italian children. The profit from the surtaxed denominations was used to support summer camps for poor children.